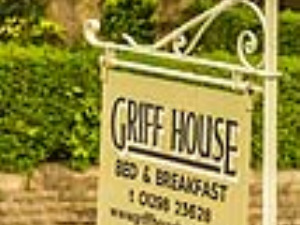 Griff House01298 23628work Bed & BreakfastGriff House was built in 1891 and is a warm, friendly place to stay. We are centrally located, within comfortable walking distance of the Opera House, Pavilion Gardens and many of Buxton's lovely pubs and restaurants but quiet enough to ensure you get a good night's sleep. Recently refurbished throughout, all rooms are en-suite with TV, Ruark DAB radio, multiple USB charging points, a fridge and tea/coffee making facilities. Free wi-fi and a residents' lounge is available. Our accommodation is non-smoking. We provide a locally sourced breakfast guaranteed to set you up, and packed lunches are available on request. Car parking is available. If you are walking or cycling we can provide clothes drying facilities and secure bike storage. Buxton is an historic Spa town on the edge of the Peak District National Park and home to Buxton Water. It is famous for the Buxton Festival and the popular Buxton Fringe Festival. We are close to many historic attractions including Chatsworth House, Haddon Hall, Hardwick Hall and Lyme Park. Poole's Cavern and Go Ape are within walking distance and the Blue John caves are nearby. Alton Towers is within easy reach. Buxton is an ideal base for both walkers and cyclists. The newly opened Monsal Trail runs from Buxton to Bakewell. Electric bikes can be hired locally.